According to the Jewish Daily Forward, both groups lived near gritty Portugal port in 16th Century. 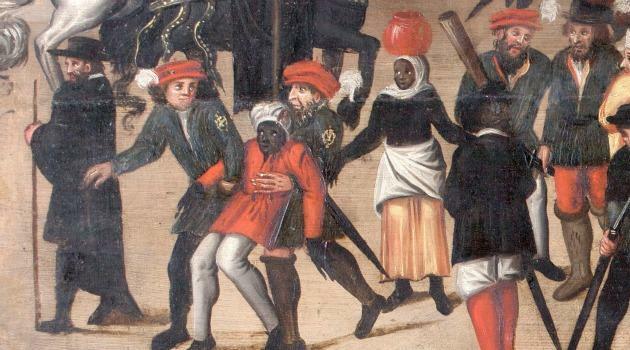 In the painting "Netherlandish" Blacks and Jews are depicted in a 16th century urban scene. The anonymous 16th-century painter who recorded a scene of everyday life at the king’s fountain (Chafariz d’El Rei) in Lisbon depicted an impressive range of people and animals. In addition to a swan, a seal, fish, horses, dogs and birds, the artist also included more than 150 human figures. 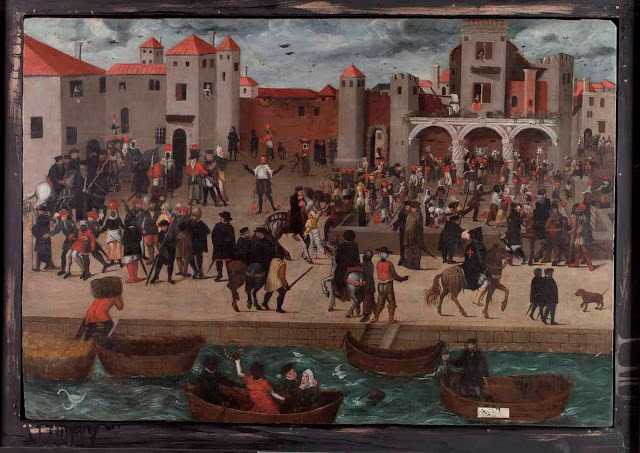 There’s so much going on in the busy scene along Lisbon’s port that Joaneath Spicer, the James A. Murnaghan Curator of Renaissance and Baroque Art at the Walters Art Museum in Baltimore, can be forgiven for initially overlooking an important detail. Only after she had finished working on the exhibition catalog did Spicer notice how many Jews appeared in the work. Below the complete view of the painting "Netherlandish", Chafariz d’el Rey in the Alfama District (View of a Square with the Kings Fountain in Lisbon), ca. 1570-80. The detail which is shown in the picture above is on the left side in the image below. A significant difference between African slaves in Renaissance Europe and pre- and post-revolutionary North America is that in Europe, slaves were more likely to be freed. According to wills, testimonies, and other documents from the 16th century, owners of black Africans in Western European countries not only liberated their slaves, but also often helped them establish livelihoods as lawyers, churchmen, schoolteachers, boatmen, authors, artists, and more. Renaissance Lisbon was home to the highest percentage of blacks in Europe at the time, ranging in status from slaves to knights. In looking further at all of the details of the painting, how can one overlook what's resembles the King Of Portugal riding upon the regally-dressed horse, wearing the cross of "The Order of Santiago" (orange cross on cape), aka "The Cross of Saint James"? Interesting! The vast majority of Jews in Spain and Portugal WERE BLACK!! They were not slaves as this post attempts to paint them. Are we assuming that because some males in the painting had big noses that they were Jews? If so they were Ashkenazim who were written to be in the Iberian Peninsual during the 10th century (coming from the Khazarian converts). How do we know that this is a painting from the 16th century, when there's no known information on WHO painted it? Based on what I know of the history of Portugal in the middle ages before slavery because of what I have read in history books, it is revisionism to try to present a picture where Jew=white and black=slave or Muslim. Totally false! Anonymous, for the record I've added the source of the information. As for the age of the painting, I believe it's from a Flemish painter and these kind of street images were typical for Flemish painters in a certain time, according to what I've read about it. As for the slavery part, perhaps you're right: history is subjective. You can tell they are Jews because,as the original article states, they were required to wear "flat berets and yellow circles affixed to their clothes, per Charles V’s ruling...". Thanks for an interesting post. Make sure to use quotes when you quote text directly or cite when you paraphrase. Greetings, please note the following corrections to the article above. The Jew depicted in the painting was the dark brown gentlemen being arrested. Its impossible for the other two gentlemen to be Jews due to the Portuguese expulsion edict and inquisition. Basically Portuguese government banished all Jews from their country in 1492. Jews were hated in Portugal. Any Jews remaining in Portugal after the deadline were arrested, enslaved, possessions confiscated, and deported to Africa. Please read the following excerpt from Wikipedia. There are several books available on Portuguese Jewish persecution. Please read whenever you have time. Thanks. "In 1492, Spain expelled its Jewish population as part of the Spanish Inquisition. Tens of thousands of Spanish Jews subsequently fled to Portugal, where King John II granted them asylum in return for payment. However, the asylum was only temporary—after eight months, the Portuguese government decreed the enslavement of all Jews who had not yet left the country. In 1493, King John deported several hundred Jewish children to the newly discovered colony of São Tomé, where many of them perished." 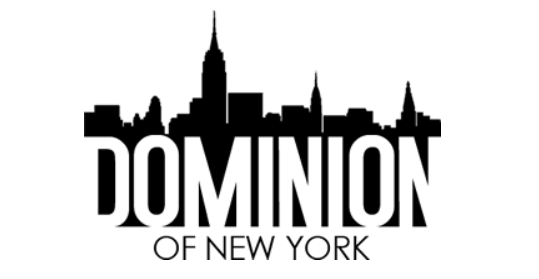 The difference between European Slavery and American Slavery is that Slavery was imported into North America by the Royal African Trade Company. The British Empire was running the show and history has been rewritten. Centuries of history have been erased, such as the Royal East Indian Trade companies drug trafficking and wars in China and India. Perhaps because the oligarchs were the original human and drug trafficking gangsters, or perhaps because they are running the show. Video: UK singer Laura Mvula - "Green Garden"